A section of rowhouses in Washington, D.C.'s Le Droit Park neighborhood. As fantastic as it is, the National Register of Historic Places can get a little confusing -- even for a seasoned pro. But fear not, because the PreservationNation blog has teamed up with Jim Gabbert, a historian with the National Park Service, to create our National Register of Historic Places Guide. Our series will unfold over the coming weeks, and cover everything from the origins and purpose of the National Register to recommendations on where to look for help with your nomination and tips on how to amend an existing listing -- and all of this information comes to you in a new video format. 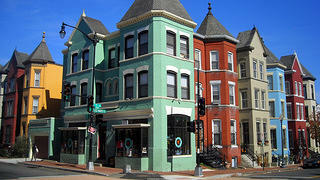 • What exactly is the National Register of Historic Places? • What is its purpose? • How many listings are there? • How many properties does the list include? • How many new listings are there per year? Special thanks to the President Woodrow Wilson House for filming accommodations.